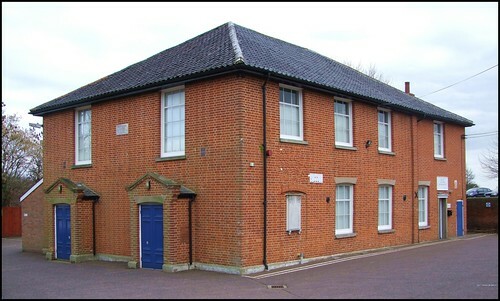 This handsome red brick building sits to the west of Stowmarket town centre, set back from Bury Street, in use for the same purpose today as when it was built in 1813. This is an unusual date for a chapel in East Anglia, and even though the building was extended to its present form in the more conventional year of 1836, at the time of the Reform Acts and a burgeoning interest in public worship, this makes it particularly worth a look. 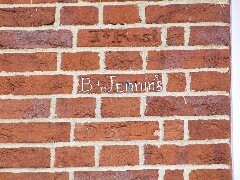 Interestingly, the names of the original covenanters are inscribed on bricks either side of the upper storey west windows. The Stowmarket Baptist congregation appears to have begun life as a planted church from the Diss and Shelfhanger congregation. A chapel was opened in 1796, but this was probably in a private house, since the word 'erected' is not used in the submitted return for the 1851 Census of Religious Worship. Stowmarket Baptist church began life as the Bethesda Particular Baptist Chapel - that is to say, it did not extend the privilege of communion to those who had not undergone a believer's baptism. TCB Timmins, in his commentary on the Census, makes the interesting point that while the Baptists had more non-conformist chapels in Suffolk than any other denomination, they were mainly based in rural areas, and the Baptist chapels in towns like Stowmarket generally had smaller congregations than other chapels. 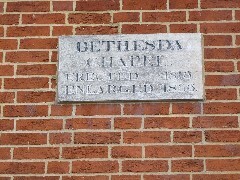 Thus, while 500 people tipped up here on the afternoon of the census, the Independent Congregationalists on Ipswich Street managed more than 800, and there were even more than 600 at the Anglican parish church - meanwhile, in the countryside, the Baptist chapels easily outweighed their Anglican neighbours in most villages. Timmins suggests that this may be because urban populations tended to be more liberal, and the 'Strict and Particular' strain in Suffolk Baptist theology was more attractive to rural people. Whatever, that militancy survives to this day, when Baptists have joined Anglicans and Catholics in being the three big denominations in the county, in comparison with which all other traditions and denominations are tiny. There's a non-conformist lesson there, perhaps.